Waterlemon Cay has been repeatedly named one of the best snorkeling spots on St. John. You will see Tarpon, sea stars, conch, sea cucumbers, green sea turtles, stingray, blue tang, large parrotfish, octopus, eels and many other sea creatures. Waterlemon is a small Cay North East of Annaberg Sugar Plantation. 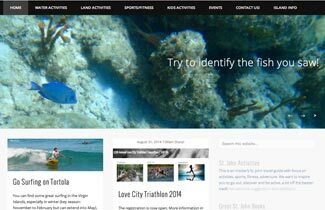 You can access Waterlemon via a snorkeling charter, via a hike and a swim or via paddleboard. The paddle to waterlemon is about a mile, which is not long, but it can be windy. It is good for beginners on days with less than 10knots of wind, in more wind it is important that you paddle with the correct technique, using the power of your upper body (not just the arms). To get to Waterlemon take the North Shore road past Maho until you see the Annaberg Sugar Planation Ruins parking lot. Waterlemon is the tiny key just off the shore. Looking at the picture below, you will be coming from the left. There are actually 2 different snorkeling spots at Waterlemon. After about half a mile of paddling, you will reach a small sandy beach with some coral rubble. 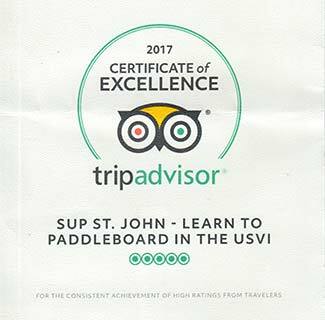 Take your board out of the water onto the sand, put on your snorkeling gear and enter the water over the coral rubble again. Watch out for sea urchins. The reef extends about 20 yards from shore and be mindful of shallow parts, do not kick the fragile star and boulder coral with your fins. 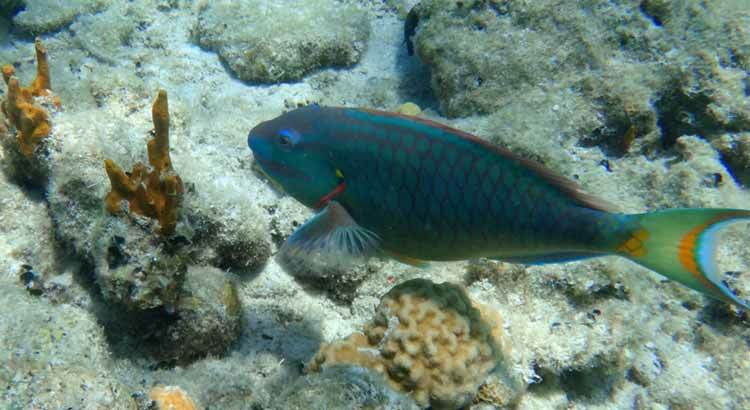 You will see many reef fish. 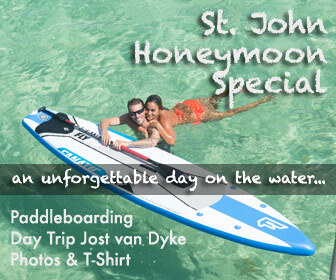 For the second snorkel you can swim out to the cay (1/4 of a mile) or get your board and paddle out. You can put the board on the sandy part of the Cay or tie it up to one of the mooring balls. There will be both seagrass and a scattered reef. The seagrass is home to starfish, conch, sea cucumbers and stingrays. Around the reef you will see plenty of fish. 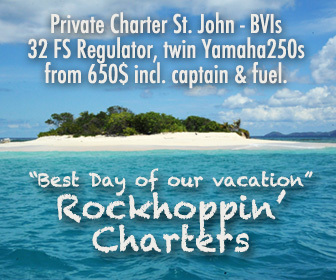 If the wind and current is not too strong you can snorkel around the whole cay. Be mindful of current (usually East to West) so try to swim with and not against it. Around the North and West Side of Waterlemon you are very likely to see Octopus. Always wear a leash and lifevest when paddleboarding. Do not paddle alone and let others know where you are going. You will most likely not have cell reception in that area, but you can rent a waterproof VHF radio from us for additional safety.Usually there are plenty of boats moored in that area. While you are there anyways, you might take a quick hike up the Jonny Horn Trail to the old guardhouse and the Murphy House. The Trail starts just at the end of the bay. The guardhouse (pictured above) used to have canons and be manned by 16 soldiers to prevent slaves from swimming over to Tortola (where slavery was abolished in 1840 vs. 1848 in St. John). A little further there is the Great Murphy House ruin, from there you have a great view down onto the bay and Waterlemon Cay.